The house is located 10 min away from the station and 5 min away from the city centre, which offers several restaurants, cafes, wine cellar, and many shopping facilities. This two-storey house has a bathroom on each floor and WC, living room with fireplace on the ground floor. 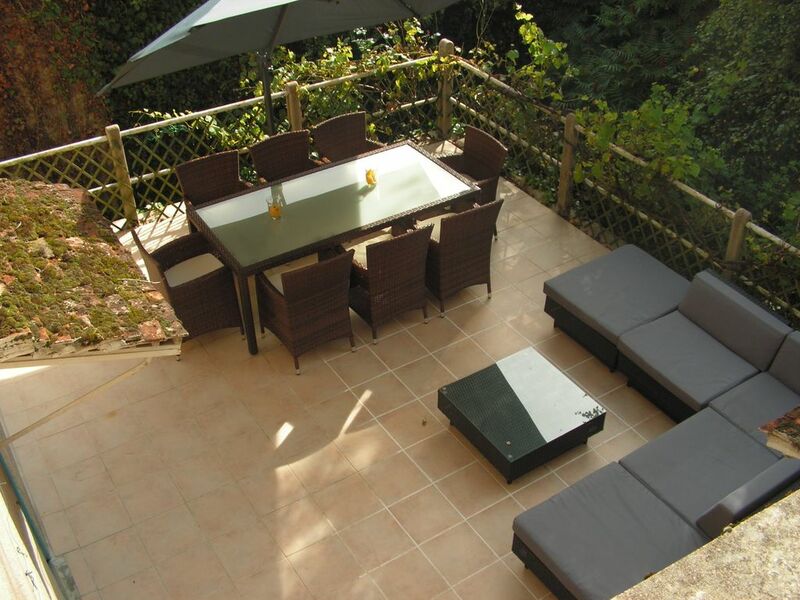 There is also a large kitchen/dining with access to a beautiful terrace, not overlooked, and a garden below. The house is located 14 min away from Baye Lake. The owner speaks French, English, Spanish, and some Italian. Located in the middle of the village, this house offers the possibility of walking on its streets, eating at a restaurant or having a drink in a terrace. There is a bathroom on each floor. 1 flat screen TV in the living room 1 flat screen TV in one of the bedrooms. Slide for children in the garden, A cottage in the garden. Lovely home in a charming town but lack of & towels without advance warning was a problem for us. We enjoyed our stay in Corbigny which is a small but charming town. The home is very convenient to the center of town and was clean and quiet. The deck in the back was delightful for relaxing and enjoying a meal. We would advise that sheets and towels are not provided and must be brought with you. This was not indicated in the description on the VRBO site. Very nicely furnished and spacious house for a normal family. Well equipped with luxuries like washing machine and dishwasher, bbq and lots of double beds. Shops and cafés in town, plenty do do/ see nearby. We went swimming, cycling, wine-tasting and sight-seeing and really enjoyed ourselves. Little caveat: one does need French to get by. But thanks to our landlady, everything was sorted out well! Thanks for a lovely stay! We will be back! Nous avez passé un excellent weekend prolongé dans cette charmante maison située à Corbigny. Celle-ci comporte toutes les installations nécessaires (lits, canapés, grande table, ustensiles des cuisine, lave-vaisselle, etc.) Pour accueuillir confortablement 10 personnes. En tout premier merci pour votre commentaire. C'est toujours agréable de recevoir aussi des personnes qui apprécient autant que nous cette maison. Je vous dis peut etre à bientot. La maison est spacieuse, bien aménagée avec une grande terrasse et un beau jardin. Equipements complets tant dans la cuisine que les chambres et les salles de bain. Proche du centre ville, pratique pour faire les courses. Nous étions 7 occupants et nous ne sommes vraiment pas marchés dessus. Logement bien placé pour visiter la région Vous trouverez pour cela toute la documentation utile dans le salon (faites la promenade de l'échelle des 16 écluses, toute proche, super!) N'hésitez pas à contacter la propriétaire, si nécessaire, elle est très sympathique. Pour résumer, un séjour agréable pour un rapport qualité/prix très satisfaisant. Haus mit Charme und französischem Flair zum Wohlfühlen und Erholen, mit schöner Sonnnenterrasse und wildem Garten, mit allem was man braucht. 30 km away from Vézelay, in an historical place, this is on UNESCO World Heritage list. 29 km away from Clamecy, its medieval district, and its factories, Corbigny is located on the lane of Saint Jacques de Compostelle, at the gates of Morvan, a regional natural park, 14 km away from Baye Lake . Corbigny is a village with many shopping facilities, restaurants and its own station.